The Top Organic Competitors report highlights the number of campaign keywords for which competitors are ranked in the top 20 organic search engine results, along with the number of tracked keywords for which the competitor's domain is ranking higher and/or lower than the campaign's primary domain. Total Search Volume and Visibility Score are included to help provide additional insights. Launch the Discovery screen to view side-by-side competitor and primary domain rank for keywords ranking on pages 1 and 2 of the search engine results. View the number of your campaign keywords that the top 10 competitors are ranking for, along with their Visibility Score and the Total Search Volume. Number of Campaign Keywords for which the competitor ranked in the top 20 organic search engine results. The number of tracked Keywords for which the competitor's domain ranked higher than the Campaign Primary Domain in the Top 20 organic search engine results. The number of tracked Keywords for which the competitor's domain ranked lower than the Campaign Primary Domain in the Top 20 organic search engine results. The number of rank positions that the Campaign Primary domain ranked higher (green) or lower (red) than the competitor domain. The total amount of the broad number of Google global searches in a month for the specified, overlapping keywords. Visibility Score is a Rank Ranger metric that is based on the position of ranking keywords and average search volume. Click the Discovery icon to reveal competitor rank vs. the primary domain rank for campaign keywords, along with monthly search volume. This organic competition report can be run for Google Global or any Google country-specific search engine. In this example we see that in the Global organic search, Amazon.com has won the top 2 search results positions for campaign keywords, but BookDepository.com is a strong competitor having captured the 3rd rank position. In this Competitor Comparison example, we see that with 10 keywords ranking in the top 10 search engine results, Amazon.com is clearly the winner over BarnesAndNoble.com with respect to the campaign’s tracked keywords. Include Primary Domain (optional): this show/hide option adds the primary domain to the table. 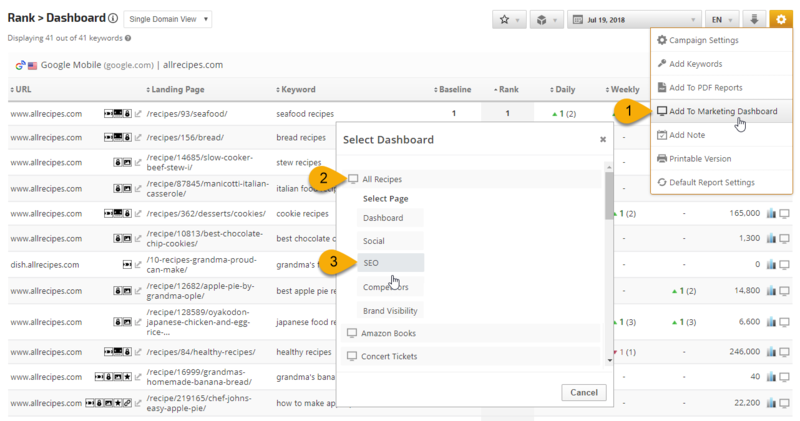 Select keyword tags to filter the report data. 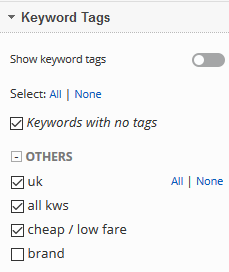 Keyword tags can be added to individual keywords or in bulk in the Campaign Settings > Keywords screen. PDF Report Content screen, then click the Add Report button and select the Campaign name and Report: Top Organic Competitors. Limit Results by selecting a number from the menu. Display Columns by moving the slider to the right for each selection. 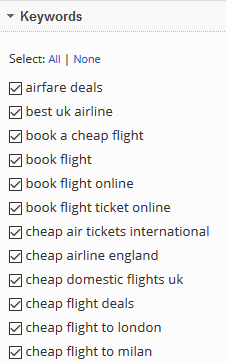 Select All or individual Keywords. 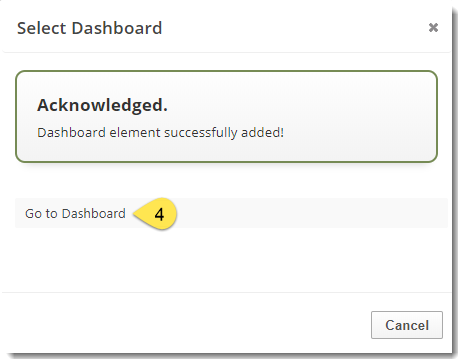 Filter the report for Keyword Tags by selecting All or individual tags. Select a Search Engine by clicking the radio button next to your selection.